The Valken ATH Tactical Helmet is a popular helmet design used in active service, Hollywood, and airsoft games. 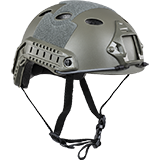 The added protection of the ATH Tactical Helmet allows Airsoft players a bolder style of play. The real life version of this helmet style offers various benefits including protection against low to medium velocity shrapnel and debris, bump protection for urban, vehicle, armored, and airborne operations. The area around the ear is shaped to allow users the flexibility to use electronic hearing protection/enhancement, communications, or ballistic side up-armor. For Airsoft use, the helmet is made of polymer making it light weight and while still looking real. The ATH Tactical Helmet provides users protection during indoor/MOUT/CQB environments in addition to guarding against BB hits at medium to extreme close range. The helmet is also designed to support mounted accessories. Most users commonly mount POV Cameras, lights/illuminators, IFF Markers (identification friend or foe), goggles, face pro, and dead rags. Compatibility with most aftermarket accessories with little or no modification.